The improvement of energy efficiency in Europe aims at reducing overall energy consumption. However, this is not an end to itself but a mean to address major future energy challenges such as energy supply security, climate change, overcoming the economic crisis (see Energy Efficiency Directive 2012/27/EU). In addition, the implementation of energy efficiency measures can have other “non-energy” socio-economic and environmental effects such as effects on social welfare (by impacting e.g. fuel poverty, comfort levels etc.) or reduced pollution levels (which has further effects on health, the eco-system). So far, existing research on the multiple benefits of energy efficiency addressing these effects is disperse and incomplete. Against this background, the overall objective of the project is to provide a comprehensive overview of the existing benefits in Europe for policy-makers, evaluators and the interested public and make research findings accessible. 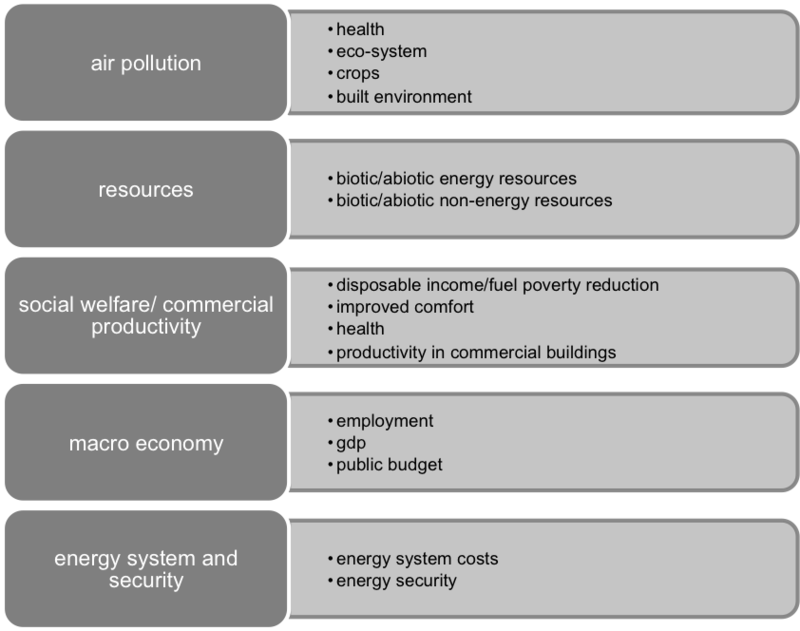 Figure 1 lists the most important co-benefits analysed within this project. communicate research findings to policy-makers, evaluators and the public through easy-to-use tools, graphs and reports. An online tool will be developed that helps the quantification of co-impacts for energy-efficiency measures in the particular context of the measure (country, sector, policy). An online communication tool will present the results graphically and provide options for the customisation/adaptation of the results to specific needs of the user. The aim is to show net costs of energy efficiency measures (including/excluding the multiple benefits). The derived default values of the elasticities and other values to allow an easy estimation of multiple benefits for concrete measures will be published open-access at the website for allowing further investigations of their implications for policy design or evaluation of existing policies by third parties. Policy-makers and researchers can include the methods and quantified values in their evaluation models, allowing a more precise assessment of the actual value of energy efficiency improvements, thus informing future decision-making for optimising energy efficiency policies in the horizon to 2030 and beyond. One main challenge to be addressed are the partly interconnections and dependencies between existing between single benefits and benefit categories. Within the COMBI project, cause-impact interrelations will be identified, analysed and included in the quantification approaches. Figure 2 illustrates these interdependencies and suggests a first attempt to identify the impact pathways, endpoints, and thus key interactions as well as potential double counting. In a first step, single benefits will in a first step be quantified using the most convenient methods and indicators. Primarily, physical units will be quantified for each benefit and in a second step, monetary indicators derived where possible (for some benefits monetisation is controversial such as health). Some co-benefits are directly dependent on the amount of energy savings (e.g. 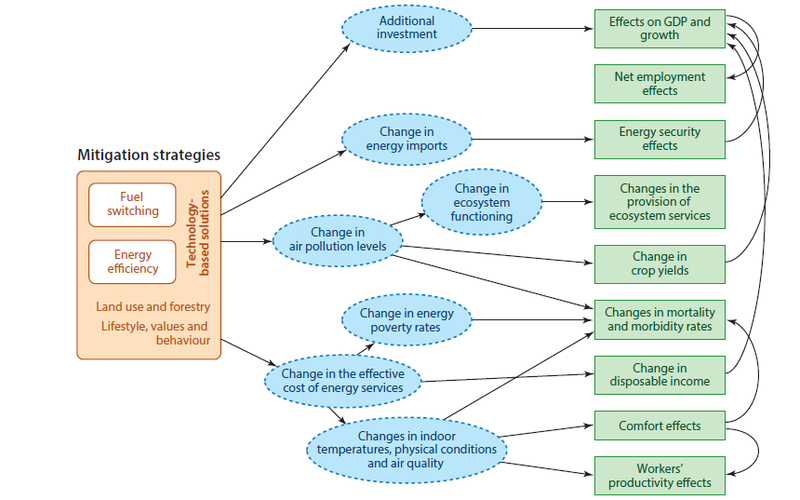 climate change mitigation, energy cost savings) while others are derived from these values and depend on rather complex cause-impact-chains across different socio-economic and environmental fields (e.g. social welfare, health impacts, GDP and employment effects). Consequently, directly energy-dependent and indirect benefits differ in their complexity of modelling. For some benefits the distributional impacts are the primary focus of interest and will therefore also be examined (e.g. local vs. centralised or outsourced/exported employment, “green jobs” vs. “traditional polluting jobs”; welfare benefits for the poor rather than the upper social segments, etc.). Other benefits include different aspects and have wide ranges, e.g. welfare covers aspects like health and disposable income. In addition, some of the co-benefits depend on country-specific and/or measure-specific characteristics (e.g. an improved building insulation has a different health impact than a lighting upgrade) with the consequence that the calculation results will also vary between and within countries and/or the implemented energy efficiency measures. When calculating outcomes, energy efficiency related rebound effects, which reduce the actual energy savings but are often related to co-benefits, will be considered where possible. Since some benefits can actually be negative for some stakeholders (such as lost employment, reduced indoor air quality, foregone tax revenues from energy sales, etc. ), the project will focus on net co-impacts rather than only benefits in order to consider the benefits in an objective framework. This project aims at informing policy-makers (on the most beneficial policy targets in terms of addressed measures and policy types), evaluators (on values of co-benefits that may be incorporated into evaluation studies) and the public, by providing data and clear-cut methods to synthesise co-impacts and integrate them into key decision-making frameworks such as cost-benefit analyses, energy efficiency cost curves or multicriteria analyses. It will also aim at developing simple calculation and visualisation methods that allow straightforward interpretations. The goal is to provide information at a disaggregation level useful to the target groups. This project intends to come up with comprehensive data on direct costs and direct and indirect benefits of representative energy efficiency improvement actions in the residential, commercial, industry and transport sectors. Values of measure-specific technology costs across the EU will be the starting point of the analysis. The project will consult the Technology and Environmental Database (TED) and define a portfolio of 20 to 30 energy efficiency measure categories. In addition and as a main goal, COMBI will provide a tool to quantify and monetise the specific multiple benefits. The project will also provide a set of default values for typical measures (conditional on country, policy, sector). Depending on the specific benefit, one value across European countries and measures may be sufficient, or country- and measure-specific values will have to be derived. The project will visualise the results in an accessible format. Via the online tool, users can personalise the results and the visualisation, including/excluding single benefits and selecting a certain country, EU region, or the whole EU.